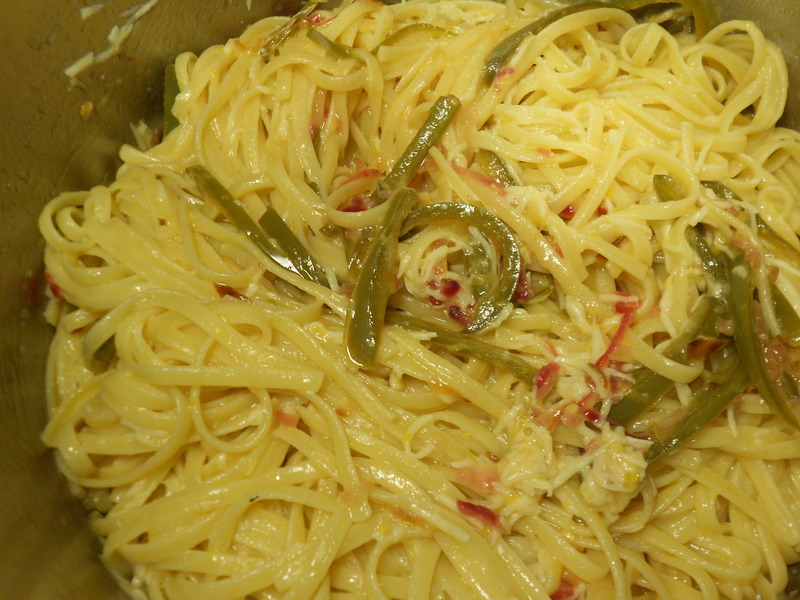 Tonight we had Mario Batali’s Fettuccine with Lemon, Hot Peppers and Pecorino Romano… but with Linguine and Locatelli. And no. Those do not count as substitutions. Because I said so. I heard this meal being described on a podcast of The Splendid Table. It seemed so miraculously delicious, the way the two women on the podcast sort of threw together the ingredients and laughed the whole way through, that I just had to know how to make this! I went in search of the recipe & found it here. Alongside the pasta we had roasted vegetables and sautéed mushrooms with spinach. 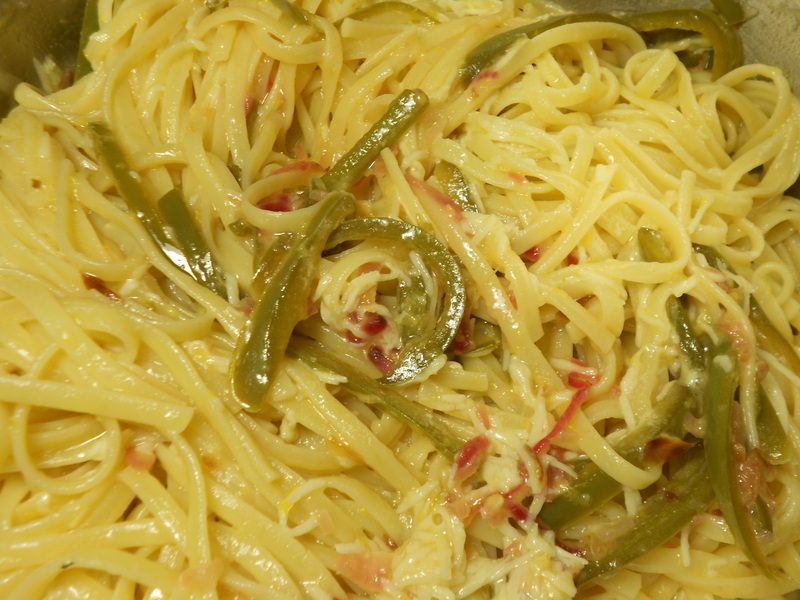 The veg were the stars of the meal, as both C and I thought the pasta a little too…well, kicky. It has 3 de-seeded jalapeños in the recipe AND a teaspoon of hot pepper flakes. I decreased the hot pepper flakes to less than 1/2 a teaspoon – but it was still a little spicy. If you love the kick of a jalapeño than this would totally work for you. 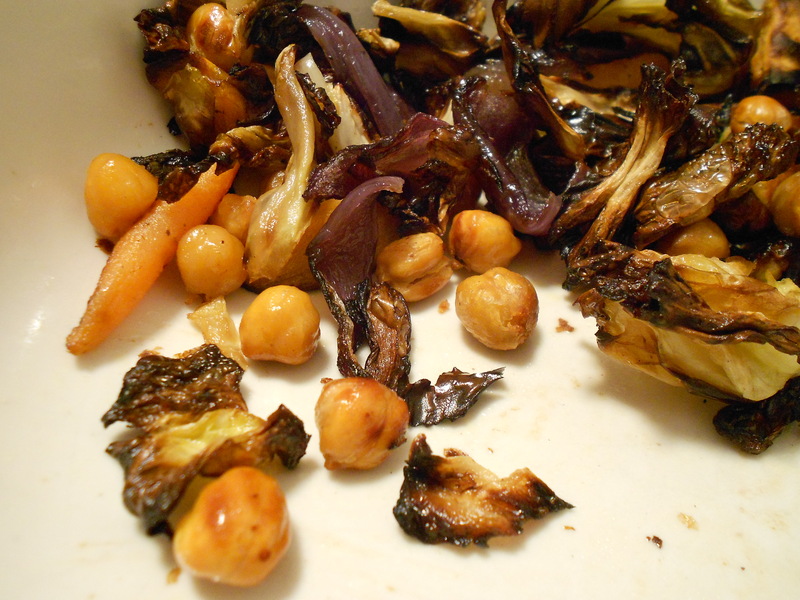 The roasted veg, I thought delicious. C thought I let it go a bit too long and it got a little burnt. Truth be told, I forgot about the veg for an extra 5 minutes so they did, indeed, get a little, ahem…crispy. Both babies and I loved the crunchy garbanzo beans. YUM! 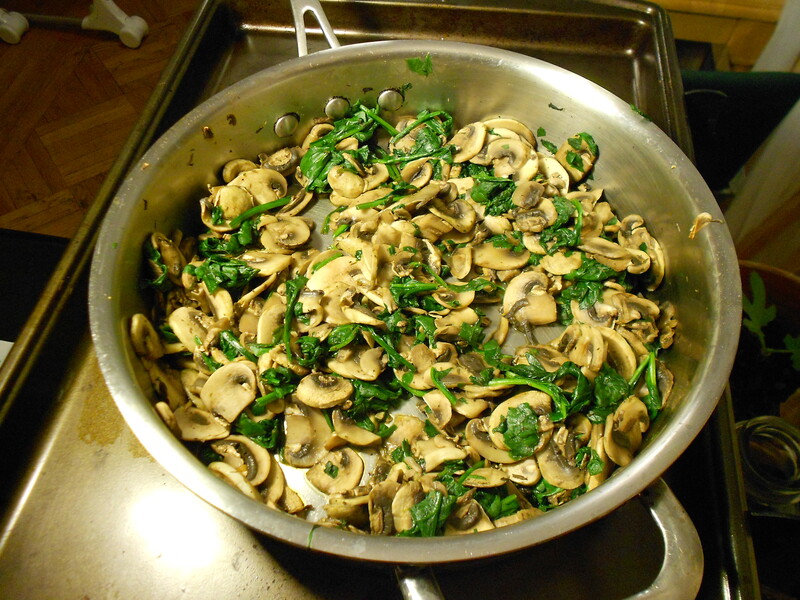 The spinach and mushrooms were the same ole yumminess I’ve been playing with the last week or so. This time I used dried thyme, fresh spinach and THREE packages of button mushrooms. Funny. I’m in the world of THREEs right now. Yesterday I made that Expand-Your-Thighs casserole that included three cheeses. Today I used 3 jalapeños in the pasta sauce, and 3 packages of mushrooms in the spinach/mushroom mix. Lalala! It’s the little things that make me smile. End Result: The spinach/mushrooms were a hit with the grownups, but we thought the pasta too hot. C said he couldn’t taste any of the cheese either, only overwhelming heat and lemon. Oh, and I ate the entire bowl of the veg BY MY SELF. I tried it mixed in with pasta, in with the mushroom mix, but honestly I gobbled this up with GREAT enthusiasm quite plainly, with a fork. 1/2 cup Freshly grated Pecorino Romano **Or Locatelli, if that’s what you have on hand. 1- Fill your biggest pot and salt it. Bring it to a boil. 2- Heat Olive Oil and add Onion and Red Pepper Flakes. Sauté until translucent then add Jalapeños. Sauté about a minute (or more if you’re like me and distracted). Add zest and juice, bring to a boil, and let it go for a minute. Remove form heat, stir in butter and season with salt & pepper. Set aside. 3- Make the pasta, then drain. 4- Toss hot pasta into pan with lemon mixture; return to medium heat. Stir together gently. Add pecorino; toss quickly. Transfer to a warmed serving platter. Serve immediately. **warmed serving platter?? Ha. I served it straight from the pot! 1- Oven to 425º. Drizzle 1 Tablespoon over a baking sheet lined with foil. Dump all the veg onto the pan and spread out. If the sheet is too crowded, shove half onto a second baking sheet. Drizzle the final Tablespoon of Olive Oil over the lot, mix then whack the pan into the oven. 3- 20 minutes later, you’ll need to rotate the pans and change their positions in the oven (top pan to the bottom rack, etc). Make sure you stir so all sides get all yummy-crunchy. Shove pan back in for another 10 minutes. 1 teaspoon Thyme. Fresh is better, but you’ll use what you have. 1- Heat your biggest skillet over medium-high heat. Throw in 2-3 handfuls of sliced mushrooms and let them sit. When they start releasing their water, stir them around (I use a flat bottomed wooden spoon to help scrape up the yummy fond *those flavor bits stuck to the bottom of the pan). Let them sit awhile longer. When the mushrooms are looking mostly cooked – but not all the way – transfer them to a bowl you’ve miraculously placed by the side of the stovetop in advance. 2- Repeat until all mushrooms are cooked. 3- Add thyme and stir. Salt and pepper – now taste. 4- Add Spinach and lower the heat. 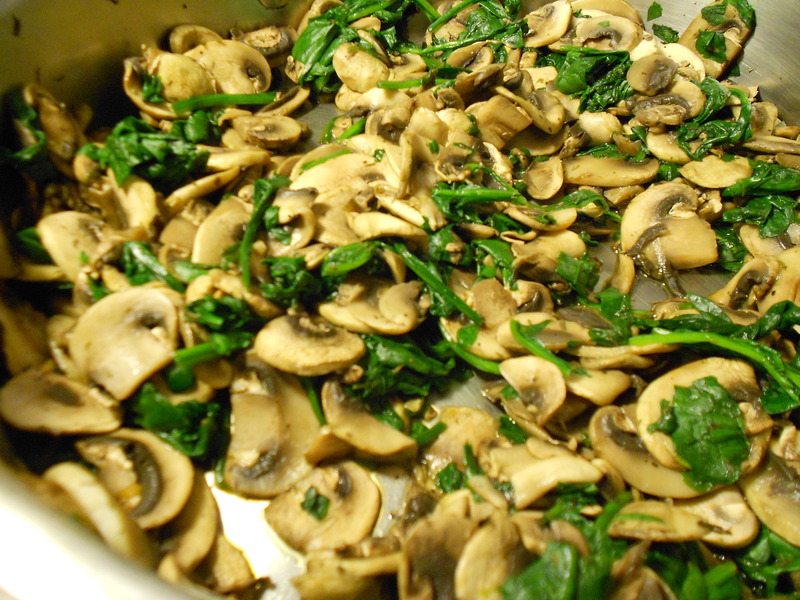 Spinach – especially the fresh stuff – cooks super quick, so let the heat of the mushrooms wilt the spinach. Keep tossing gently to incorporate all the flavors. You can serve this warm or luke warm or even straight from the fridge. ALL taste good! 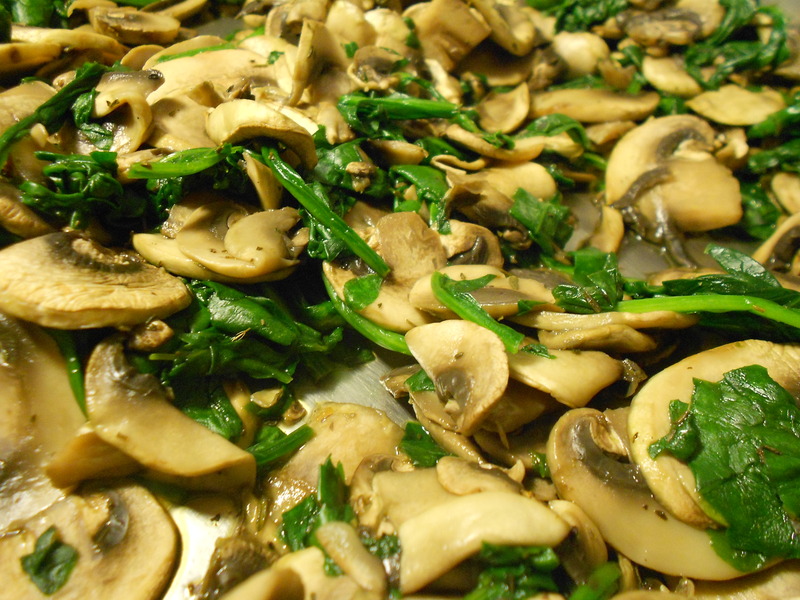 Fresh spinach and sliced mushrooms, a little dried thyme and away we go!